QIP is a unique closed source computer program for immediate cross-internet communication. The basic functionality of QIP enables its users to see who else is online and available, and then easily contact them with text messages in real time sent through a public server. Guys with one star from the bottom is 100% correct.If you care about privacy and don't want to loose you personal ID, login and passwords,DO NOT USE this app. Don't even look at the screenshot. Oh no I looked. Don't install this unless you are mad. One of the the worst pieces of crapware I've ever seen in my life. Use Miranda which is much faster, lighter and doesn't abuse your system by installing junk additions. Seeing how this application is nothing other than a scam to steal people's ICQ#'s perhaps the betanews people would be nice enough to actually remove this program from the site. DiamOnd - that is a bummer you lost your ICQ#. I'd said in previous posts that this thing is a pile of crap and was made to steal ICQ numbers and send spam - hopefully others here will read the warnings and not loose their ICQ #. This is beyond crap. My ICQ number got stolen after I used QIP. After registering, it will be sending spam to your contacts. Also, you will magically find out that you have a blog page on their site, where all your status updates will be posted. This project was sold to a russian media conglomerate, and now it is doing what it was paid to do: generating clicks from users. By ANY means possible. Recently, I've learnt that by default QiP saves all your user identification data on RBC servers (ICQ/jabber user/password/etc). Good bye, privacy. ...but again - so many other options out there that are either a) open source or b) from someone more well known. QIP Infium supports GTalk and Jabber too. So don't post your review if you even doesn't try program. I like QIP for it's minimalistic, but pretty interface and alot of options (Miranda preferences is a geek hell). 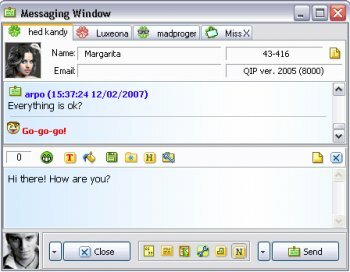 Also QIP has "meta-contacts" for merging ICQ\Jabber account of your friends. PS: btw, ICQ is the most popular IM in exUSSR countries. Nobody use MSN or AIM in Russia, so QIP is a great tool for me. whoa, the 1990's called and said they want their IM's back. I do enjoy using IM programs, I just don't like the space they hog. That is why I use Trillian. How ever Skype blows both this and trillian out of the water. Sorry folks, I don't like sharing my info. with the public. Skype is encrypted. You obviously don't know anything about ICQ. It has been invented in 1997, not 1991. Don't really see the point in using this. There are too many other freeware alterntives that off many more features (such as Miranda). Still giving it a 2 instead of a 1 though - just because it DOES look the programmers did a decent job. ICQ? who uses that anymore.. it's not 1991!